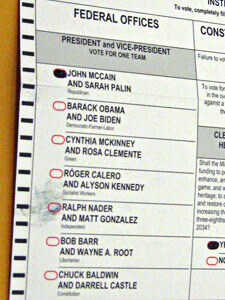 Here the problem is the fingerprint on the ballot. 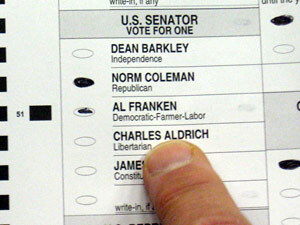 Election laws prohibit voters from putting distinguishing marks on their ballots, and marked ballots are declared invalid, for good reason: uniquely marked ballots can be identified later, allowing a criminal to pay the voter for voting "correctly" or punish him for voting "incorrectly". Is the fingerprint here an identifying mark? 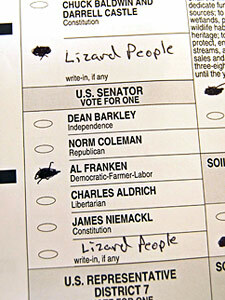 And if so, how can you reject this ballot and accept the distinctive "Lizard People" ballot? Still, we need to keep this in perspective. 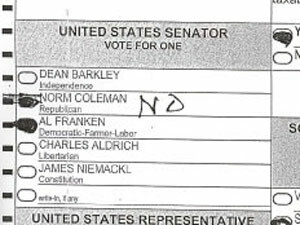 By all reports, the number of ambiguous ballots in Minnesota is miniscule, compared to the total number cast in Minnesota. Let's hope that, even if some individual ballots don't speak clearly, the ballots taken collectively leave no doubt as to the winner.